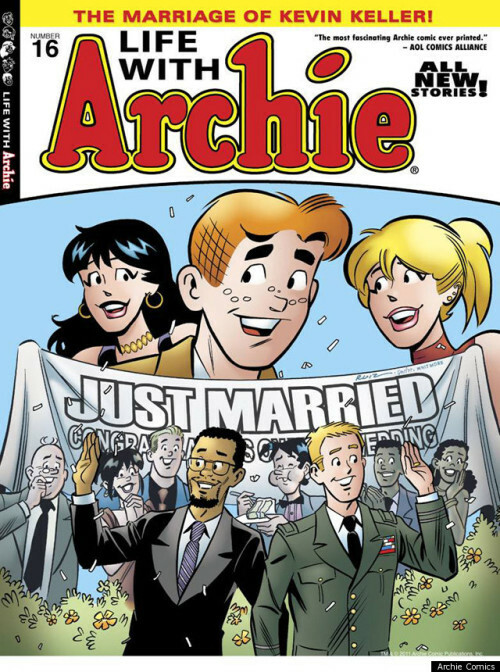 The highly-anticipated gay wedding issue of Archie Comics has finally been revealed. The January issue’s cover illustration shows Kevin Keller, Riverdale’s first openly gay character who is also an active U.S. military officer, tying the knot with his African-American partner, Clay Walker. It should also be noted that because of his astronomical success, Keller will be getting his ongoing series in February. How Archie seems to get it (and get it right) while other comic book companies pay lip service to diversity amazes me to no end. Archie Comics: DOING IT RIGHT!!!!!!!! Like I needed another reason to fall in love with this character. Hello everyone and welcome to episode 9 of Brain Food, where I give you a double feature today! I genuinely hope that everyone enjoys it. Additional intel can be found here. Think Disney is empowering women and girls to achieve their dreams of love, happiness, and independence? Perhaps, as long as they aren’t Black women and girls. So one of the most popular new shows this season has been the hit series Once Upon A Time. RVC Bard and I have been having some excellent discussions about the characters, the plot, etc. I’ll be the first to say the show has its work cut out for it, but there’s a lot of potential there. I certainly find myself liking it a lot more than I thought I would. Will you support queer Black women’s stories on stage? Earlier this year, I wrote and produced a play called Tulpa, or Anne&Me that debuted at the Planet Connections Theatre Festivity. Since that first production, I’ve often been asked about what’s next for Tulpa, or Anne&Me. This is a great sign because it means that the play has touched people in some deep places and led to powerful moments of growth and healing for many. I feel a real responsibility to make this piece the best I can make it and bring it to as many places as I can where people want and need to see it. Right now, I’m talking with someone who can offer me an opportunity for more performances in mid- to late April. Despite the fact that I’m based in NYC, there are still only a few plays by and about queer Black women being made. Although the world we live in wants me to be comfortable with feeling insignificant, I no longer have the luxury to deceive myself into believing that my work and my voice are not important. I am raising $3,000 for the 2012 production of Tulpa, or Anne&Me. If I reach this goal, my work will have another chance to do what it’s meant to do — pave the way for healing and transformation in our lives, relationships, and communities. If you contribute to this project, you will be doing more than putting a story on stage, but creating a vibrant opportunity to honor those of us who are Black and woman and queer. Will you contribute to be part of that process? On Saturday, November 19, fellow artist and internet husband Neo Prodigy (aka Dennis R. Upkins) will do a book signing for his debut novel, Hollowstone. In honor of that occasion, I’m finally doing something I don’t normally do and talk at length about a piece that has had a strangely parallel journey with my work work on Tulpa, or Anne&. Sorry for the long absence between posts — and thanks to all the posters new and familiar who continue to do completely awesome and eye-opening things while I’m off in the wilds of conference planning and manuscript editing. I’m making up for the lost time by writing an extra-long post — aren’t you excited? You Got That Moxie Baby!!!! So as many of you know, my novel, Hollowstone, was released through Parker Publishing. A fine indy press that celebrates quality fiction for readers of distinction, Parker celebrates black, multi-cultural and multi-ethnic literature. In addition, it’s been the home to some world class authors, including the late L.A. Banks. While romance has been Parker’s tour de force, they’ve recently made a concerted effort to expand and branch out into other genres through various imprints. I was honored to learn that Hollowstone was in fact one of their first titles for their Moxie line. Moxie focuses on the multi-ethnic Young Adult stories which ranges from the contemporary to paranormal. These tales explore the young adult’s journey while embracing the diversity of culture. In addition to Hollowstone, Moxie also some other excellent titles. Excellent titles whose signal should be boosted.